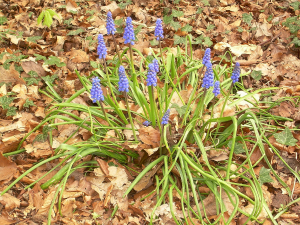 Observation - Small Grape Hyacinth - UK and Ireland. Description: Hairless plant 25cm tall. Leaves grass-like, to about 8mm wide, narrowing towards tip. Flower spike dense, about 3-6cm long. Flowers conical and hanging, perianth segments almost fused. Scentless. Dark blue with white border and outwardly pointing teeth. Hairless plant 25cm tall. Leaves grass-like, to about 8mm wide, narrowing towards tip. Flower spike dense, about 3-6cm long. Flowers conical and hanging, perianth segments almost fused. Scentless. Dark blue with white border and outwardly pointing teeth.